Now that we’ve reached the mid-point of the year, it’s a good time to look back at the economic forecasts we made at the beginning of the year and revisit how we expect the rest of the year and beyond to play out. 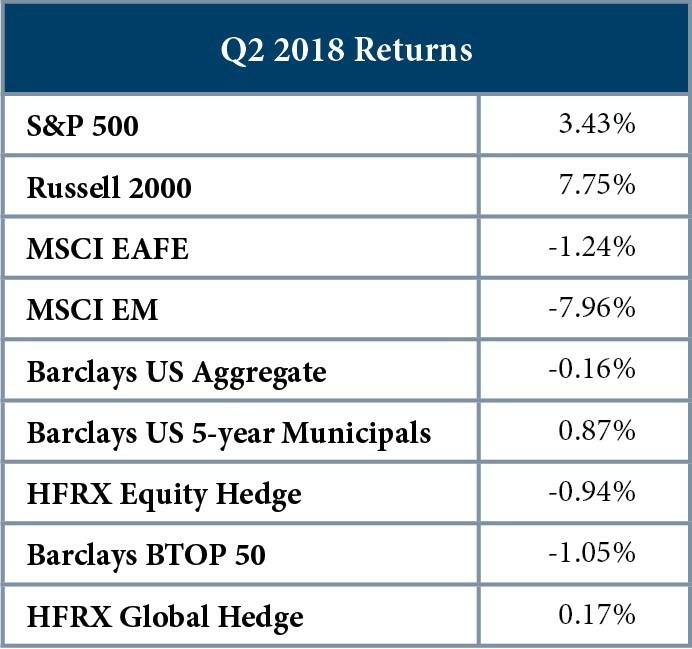 In January, our expectations for 2018 included a measured outlook for equities, including higher volatility, and a downright dour forecast for fixed income returns. These views have largely come to fruition. US equities, as measured by the S&P 500, are up 2.65% through June, as a second-quarter rally regained some of the ground that was lost in the first quarter. Bonds have largely suffered during the year as the Federal Reserve has maintained its steady pace of rate normalization. (Recall that rising rates negatively impact the value of existing fixed-rate debt.) The Bloomberg Barclays US Aggregate Bond Index is down 1.62% so far in 2018. Market volatility, as measured by the CBOE Volatility Index, has increased 45% so far in 2018. While this may seem like an extreme jump, remember that this simply reflects a return from 2017’s historically low levels to more normal levels of volatility. One item that we wrote about extensively in our Q1 letter and that continues to dominate daily headlines is the “trade war” between the US and its trading partners. While our views on trade policy haven’t changed since last quarter, we’d be remiss to publish a market commentary without at least a passing mention of the situation. 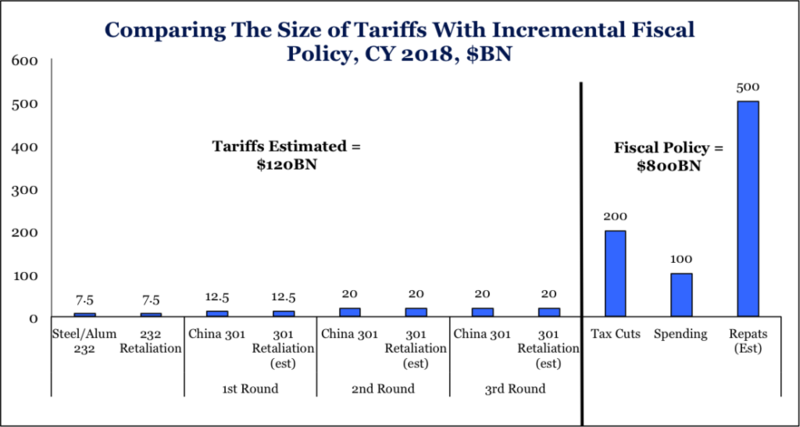 As Figure 1 illustrates, the total size of the trade tariffs—those imposed by the Trump administration combined with retribution from America’s trading partners—pales in comparison to the fiscal stimulus that was passed into law last December. This critical detail is often overlooked by market pundits. Global markets clearly dislike the Trump administration’s approach to trade policy, but market values do not reflect the perceived negative impact of the tariffs on economic growth on this matter. This is largely because many market participants believe that the current rhetoric is more bluster than a deeply held conviction that the White House will adhere to these policies as they lose popularity. If the Trump administration more convincingly communicates its commitment to tariffs, however, we believe that the result will be continued price volatility with a downward bias on equity prices. Looking beyond the near-term rhetoric, we don’t believe that the Trump administration favors an economic system of nationalism and a permanent restriction of free trade. Instead, we believe that the administration is trying to renegotiate trade agreements and use America’s hegemony as leverage to strike more favorable terms. We believe that this administration—despite its rhetoric and actions thus far to the contrary—fundamentally supports trade policies that are rooted in the theory that free enterprise, not governments, are the best allocators of capital. We believe that President Trump’s freewheeling communication style and bombastic, unconventional approach to negotiating cause many to misinterpret his philosophy of economics. We don’t make these distinctions to endorse one political party or the other. 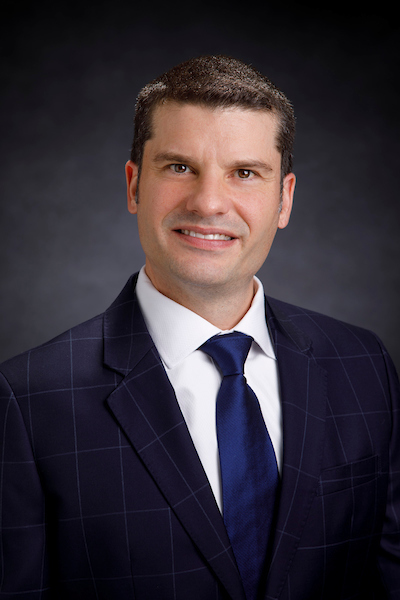 Rather, our goal is to clarify where we believe the current administration stands on economic views as it informs our actions for allocating our clients’ capital. If we are incorrect—and Trump in fact is a neo-mercantilist—then the outlook for the US and global economies should be significantly dimmer. These types of protectionist policies, such as the Smoot Hawley Tariffs Act, were tried and failed in the 1930s during the Great Depression. They deepened the depth of economic misery the US suffered during this dark period. Interest rates, and specifically the slope of the yield curve, are other areas about which many investors are currently worried. As a reminder, a normal yield curve slopes upward, with lenders receiving higher interest rates on longer-term obligations than on shorter-term ones. This dynamic represents the fact that longer-term obligations are inherently riskier. Since 2013, the yield curve has flattened considerably, as short-term rates have risen faster than long-term rates. As the spread between long- and short-term rates narrows, the risk that the yield curve inverts (i.e., long-term rates become lower than short-term rates) increases. Historically, inverted curves have been a dependable harbinger of economic recession. Why? An inverted curve develops when the market expects future economic weakness, and thus begins to price in future rate cuts by the Fed. Might the Fed prematurely stop its current monetary tightening efforts to avoid an inversion of the curve? We don’t think so. The Fed has explicitly stated that it would rely on data in weighing any changes to its current pace of rate hikes. We think that changing course simply to avoid inversion would be unwise and could create the risk of a far worse future outcome. Said differently, if the Fed failed to sufficiently slow inflation through rate hikes, it could increase the risk of recession. Additionally, the Fed would then need to conduct even more restrictive monetary policy in the future, potentially deepening the severity of a recession. As a reminder, FineMark is neither forecasting an inversion, nor a recession, in 2018. We believe that the current risk of recession is low, and economic momentum appears healthy. At the beginning of the year, our forecast for long-term rates in 2018 was 3%; we maintain that view. 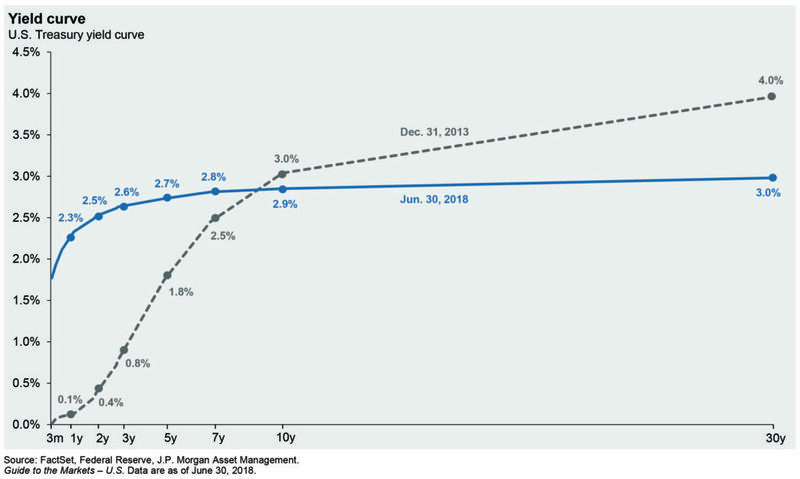 We believe that long-term rates could move up modestly in 2019, perhaps to 3.25%. Based on a multitude of macroeconomic and demographic factors, we don’t see a strong underpinning for significantly higher rates. That said, one area we are watching carefully is how continued reductions in unemployment and a tightening labor market could manifest into inflation. 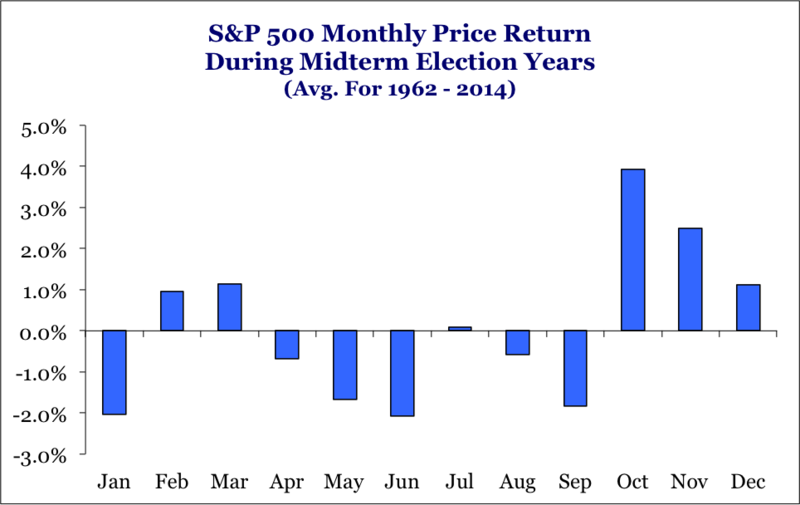 Another item that deserves investors’ attention is the upcoming midterm elections in November. Historically, the incumbent party—in this case the Republicans—loses seats in both the House and Senate during midterm contests. As shown in Figure 3 below, the months leading up to midterms tend to be more volatile—at least until market participants have a clearer picture of the expected outcome. We wish you a relaxed and restful summer and hope you enjoy some downtime during this typically slower time of the year. As always, we are happy to answer any questions you have about global economics, financial markets, or your personal investment portfolio. Thank you for your continued confidence and trust. ‘Tis better to give than receive – But is it still tax deductible?